Abstract: Dan Bloom of MDRC examines policies and programs designed to help high school dropouts improve their educational attainment and labor market outcomes. So called “second-chance” programs, he says, have long provided some combination of education, training, employment, counseling, and social services. But the research record on their effectiveness is fairly thin, he says, and the results are mixed. Bloom describes eleven employment- or education- focused programs serving high school dropouts that have been rigorously evaluated over the past thirty years. Some relied heavily on paid work experience, while others focused more on job training or education. Some programs, especially those that offered paid work opportunities, generated significant increases in employment or earnings in the short term, but none of the studies that followed participants for more than a couple of years found lasting improvements in economic outcomes. Nevertheless, the findings provide an important foundation on which to build. Because of the high individual and social costs of ignoring high school dropouts, the argument for investing more public funds in services, systems, and research for these young people is strong. The paucity of conclusive evidence, however, makes it hard to know how to direct resources and magnifies the importance of ensuring that all new initiatives provide for rigorous evaluation of their impacts. Bloom concludes with recommendations for policy and research aimed at building on current efforts to expand and improve effective programs for dropouts while simultaneously developing and testing new approaches that might be more effective and strengthening local systems to support vulnerable young people. He stresses the importance of identifying and disseminating strategies to engage young people who are more seriously disconnected and unlikely to join programs. A recurring theme is that providing young people with opportunities for paid work may be useful both as an engagement tool and as a strategy for improving long-term labor market outcomes. The transition to adulthood is likely to be perilous and rocky for young people who drop out of high school. In fact, even those who earn a high school diploma or a General Educational Development (GED) certificate face increasingly long odds of success if they do not go on to get at least some postsecondary education or training. Young people from low-income families are substantially less likely than their higher-income peers to move smoothly through school, making it much more difficult for them to earn family-sustaining wages and, potentially, to reach other adult milestones such as marrying. Through a variety of school reforms beginning in preschool and running through high school, U.S. educators are working to prevent young people from getting off track. For the foreseeable future, however, the nation will also need “second-chance” systems and programs to re-engage and re-direct young people who leave the public school system. The research record on the effectiveness of such programs is fairly thin and the results are mixed, but there are some positive findings on which to build. Moreover, the individual and social costs of neglecting this problem are potentially enormous. I begin by describing the magnitude and consequences of the dropout problem, with a particular focus on the heterogeneity of the dropout population. Next, I describe what researchers know about the effectiveness of programs designed to assist young people who leave school before graduation, focusing mainly on how the programs affect participants” educational attainment and labor market outcomes. I conclude with some recommendations for policy and research that would build on the current evidence base to expand and improve effective programs for dropouts while simultaneously developing and testing new approaches that might be more effective. As figure 1 shows, however, the above data mask huge differences by socioeconomic status. As noted, higher-income students are much less likely to drop out in the first place. And almost all of the higher-income dropouts earned a GED or diploma by 2000. By comparison, less than half of the low-income dropouts had a credential by 2000. 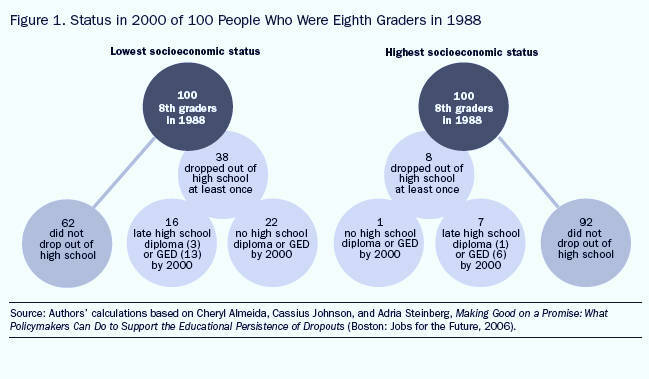 Similarly, among those in the highest socioeconomic group, 67 percent of those who had a diploma or GED had enrolled in college, compared with 29 percent of those in the lowest group (numbers not shown in the figure).12 Young people from higher-income families who drop out of school are often able to get back on track, while their lower-income peers are more likely to flounder. Not so long ago, second-chance programs that helped dropouts earn the GED credential were fairly clearly differentiated from traditional high schools. Today the landscape is far more varied. On the one hand, many school districts are developing “multiple pathways” initiatives that offer a wider range of high school options in an effort to prevent young people from leaving the K–12 system. For example, New York City’s Office of Multiple Pathways has created Transfer Schools (small schools specifically designed for students who have fallen behind for their age or who have dropped out) and Young Adult Borough Centers (evening programs for older students operated by partnerships between schools and community organizations), along with new GED programs, all of which are supplemented by Learning to Work, a program that provides job readiness instruction and paid internships. On the other hand, some community-based programs with experience serving dropouts now operate charter schools or alternative high schools. For example, YouthBuild, a large national network of programs known for serving dropouts and targeting the GED, now includes twenty-nine diploma-granting schools. Moreover, although second-chance programs once viewed the GED credential as the ultimate goal, their aim now is increasingly to help former dropouts obtain postsecondary education, which has become a virtual prerequisite for admission to the middle class. The Gateway to College program, developed at Portland (Oregon) Community College and now operating in twenty-three other community colleges across the country, gives high school dropouts a chance to attend high school and college simultaneously. Gateway students begin as a group during the Foundation Term, during which they strengthen basic academic skills and adjust to college. Those who succeed in these courses gradually move into the regular college curriculum. Gateway relies on “average daily attendance” funding from the K–12 system even though students are enrolled at a community college. In addition, the Bill and Melinda Gates Foundation has given grants to YouthBuild and other community-based youth employment programs to help them build pathways to postsecondary education for their participants. These college-focused efforts appear to be growing, though they are likely to serve a subset of dropouts with stronger academic skills. Most programs that target high school dropouts have never been formally evaluated for effectiveness. Moreover, because the programs are often run by small community-based organizations, the most rigorous evaluation methods are probably not feasible or appropriate in many cases. The result is a gap between the strongly held views of practitioners who believe they know what constitutes “best practice” in youth programming, on the one hand, and the knowledge base researchers have built from rigorous evaluations, on the other. Although the programs and studies can be categorized in many ways, table 1 groups them according to their primary service approach. The first three programs “the National Supported Work Demonstration, the Youth Incentive Entitlement Pilot program (YIEPP), and the Conservation and Youth Service Corps “relied heavily on paid work experience, while the next six “JOBSTART, the National Job Training Partnership Act, New Chance, the Center for Employment and Training (CET), Job Corps, and National Guard Youth ChalleNGe “focused more on job training or education. The last two “the Teenage Parent Demonstration and the Learning, Earning, and Parenting program (LEAP) “were mandatory, welfare-based programs that encouraged, supported, or required teenage mothers to work or go to school. This classification scheme is useful in understanding the broad patterns of program effects, but it is far from perfect. For example, two of the work programs include a strong emphasis on education, and some of the training programs provide work experiences of some kind. More important, the simple categorization does not capture critical factors such as the program atmosphere or the types of ancillary services, supports, and activities provided to participants. Overall, the evaluations tell a mixed story. In several, young people in the program group were substantially more likely than their control group counterparts to earn a GED or another credential. For example, in the Job Corps evaluation, 42 percent of the program group earned a GED within four years after entering the study, compared with 27 percent of the control group. Similarly, 38 percent of the program group earned a vocational or trade certificate, compared with only 15 percent of the control group. 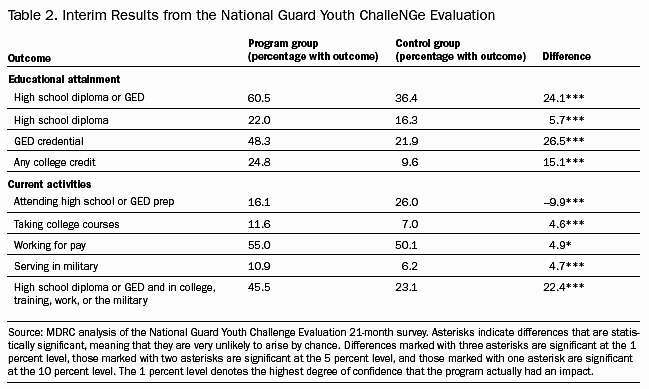 Interim results from the National Guard Youth ChalleNGe evaluation show that about 61 percent of the program group and 36 percent of the control group earned a GED or diploma within twenty-one months after study enrollment (see table 2). The JOBSTART and New Chance studies reported similar findings. Some of the programs, especially those that offered paid work opportunities, also generated significant increases in employment or earnings in the short term. For example, in the National Supported Work Demonstration, which provided subsidized (paid) jobs for up to twelve to eighteen months to dropouts aged seventeen to twenty, the difference in employment rates between the program and control groups was as high as 68 percentage points early in the follow-up period. Similarly, the Youth Entitlement project, which guaranteed part-time and summer jobs to all disadvantaged young people in certain geographic areas who agreed to attend school, employed 76,000 youth and virtually erased the large gap between the unemployment rates for white and black youth. The Conservation and Youth Service Corps also provided subsidized jobs and generated some statistically significant increases in employment outcomes, particularly for African American males, over a relatively short follow-up period. The Job Corps program did not rely on subsidized jobs but still managed to increase employment and earnings in the third and fourth years of the study period “and even longer for older participants (aged twenty to twenty-four at enrollment). Similarly, as shown in table 2, the National Guard ChalleNGe evaluation found that program group members were modestly more likely than their control group counterparts to be employed twenty-one months after entering the study. JOBSTART, which operated in thirteen sites, showed no significant earnings gains overall during a four-year follow-up period, but the study measured large impacts in one site, the Center for Employment and Training in San Jose, California. However, as shown in table 1, when CET was replicated in twelve sites during the 1990s, an evaluation found no increases in earnings over a fifty-four-month follow-up period (women at the program sites that most faithfully implemented the model made shorter-term earnings gains, but these gains faded after year three). Several of the studies measured non-economic outcomes such as crime involvement, drug use, health, and psychosocial development “again, with mixed results. Partway through the evaluation's follow-up period, the National Guard ChalleNGe program has produced modest decreases in crime convictions and improvements in some measures of psychosocial development. The Job Corps significantly reduced arrests, convictions, and time spent incarcerated over the first four years of the study period (these outcomes were not measured after the four-year point). The Conservation and Youth Service Corps reduced arrests overall and had a range of positive effects on non-economic outcomes for African American study participants. For example, African American females were less likely to become pregnant and African American males improved in measures of personal and social responsibility. Few of the other programs generated impacts on these non-economic measures. Overall, these findings do not support the common perception that “nothing works” for high school dropouts. Many of the positive effects produced by the programs, however, were modest or relatively short-lived. Moreover, the studies suggest that even some of the relatively successful programs may have difficulty meeting a strict benefit-cost test. The authors of the Job Corps evaluation concluded that the benefits produced by the program probably exceeded its costs (about $16,500 per participant) for older participants, but not for the full study sample. Nevertheless, the findings provide an important foundation on which to build. One important study is not included in table 1 because it targeted in-school youth, but the findings may be relevant to the topic discussed here. A random-assignment evaluation of Career Academies, a high school-based model, found that it produced statistically significant increases in earnings over an eight-year follow-up period. Men in the program group earned about $30,000 more than their control group counterparts over the eight years even though they were no more likely to graduate from high school or go to college. The researchers suggest that the program’s use of “career awareness and development activities,” including job shadowing and work-based learning activities, may have contributed to the earnings gains. Perhaps most interesting, the Career Academies produced significant effects on several adult transition milestones. At the end of the follow-up period, program group members were more likely to be living independently with children and a spouse or partner, and young men in the program group were more likely to be married and to be custodial parents.19 These findings suggest that improving young people’s economic prospects may ease their transition into other adult roles. It is difficult to draw cross-cutting lessons from the evaluations in table 1 because there are many programs and not many unambiguously positive results. For example, the data do not support clear conclusions about whether paid work, a residential structure, or other program design elements are associated with more positive results in random-assignment studies. It is possible, however, to make a few general points. First, although sustained positive effects would obviously be preferable, short-term effects are not unimportant. When programs achieve short-term increases in earnings or other outcomes, those effects are not erased if the program and control groups have similar outcomes later. Although many programs assert that they can alter the long-term trajectories of their participants, it is worth considering whether it is reasonable to expect even the strongest youth programs to produce effects that can still be measured many years later. Results like those achieved in the Career Academies evaluation, where earnings gains persisted eight years after students had completed high school, are very rare “and the Academies that were tested did not serve a highly disadvantaged group of young people. Some experts have raised the question of whether it is more appropriate to think of time-limited programs for dropouts as inoculations, whose effects may last forever, or as vitamins, whose effects wear off if they are not taken consistently. Second, it is important to note that almost all the programs (and the control groups as well) involved youth who had volunteered to participate “and who thus had at least some motivation to change their lives. In fact, some of the programs extensively screened applicants and accepted only those who demonstrated strong motivation and commitment. Thus the young people who ended up in the control groups likely sought out other programs in the community and received some of the same kinds of services that program group youth received. The study results could thus be interpreted to mean that the tested programs did not do much better than other programs in their communities, but that all of the programs were relatively effective for motivated participants. That said, most of the evaluations also found that outcomes were relatively poor for both research groups. For example, in the Job Corps study, the average employed sample member earned only about $10,000 a year during the later years of the follow-up period. Similarly, in the JOBSTART study, only about 65 percent of sample members worked at all in the final year of the study period, and those who worked earned less than $9,000, on average. In other words, regardless of their effects, the programs” outcomes leave much room for improvement. Third, it is possible that the difficulty in achieving sustained increases in economic outcomes may be traced, in part, to the educational goal of most programs “to help participants pass the GED exam. Many studies have concluded that the labor market does not, in fact, view the GED as equivalent to a high school diploma. In other words, GED holders earn significantly less than people with regular high school diplomas. Some studies have even questioned whether GED holders earn more than uncredentialed dropouts, though some recent studies suggest that the GED does have an economic payoff, at least for dropouts with low skills “although the payoff may take several years to appear. Studies have also shown that postsecondary education pays off as much for GED holders as for high school graduates, but only a small minority of GED holders complete even one year of postsecondary education.20 These data may help explain why programs that substantially increased GED receipt did not lead to longer-term gains in employment or earnings. Others maintain that some of the earlier youth programs were “deficit focused” “that is, they defined participants by their problems and sought to “fix” them. These experts recommend that programs should not only provide participants with training or a job, but also expose them to a range of settings, activities, and relationships that are thought to promote healthy development across a wide range of domains. One study identified these domains as cognitive, physical, social and emotional, ethnic identity, civic engagement, and career.22 Young people from higher-income families are more likely than their lower-income counterparts to have positive experiences in these developmental areas in their families, schools, and communities. Programs may help to fill these gaps by exposing youth to responsible, caring adult role models; by creating a safe, positive group identity among participants; and by giving young people opportunities to act as leaders and to contribute to the broader society. Among current programs, for example, YouthBuild helps young people work toward their high school diploma or GED while simultaneously learning job skills as they build or rehabilitate housing for homeless and low-income people. It emphasizes service and leadership development by giving young participants a key role in running the program. Participants also receive stipends or wages. Similarly, Service and Conservation Corps, descendants of the Depression-era Civilian Conservation Corps and of the American Conservation and Youth Service Corps evaluated in 1990 (see table 1), combine intensive community service with job training and education. Crews of participants work on conservation, urban infrastructure, and human services projects and receive stipends. A third such program, ChalleNGe, includes a five-month residential phase built around eight “core components” designed to promote positive development: service to community, leadership and followership, responsible citizenship, health and hygiene, life-coping skills, physical fitness, job skills, and academic excellence. In a final such example, City Year, participants devote a full year to community service and civic engagement, wearing uniforms to build a team identity and make their work highly visible to the community. Because the program is open to young people from a wide range of backgrounds, participants may be exposed to people quite different from themselves. It is widely believed that programs built on positive youth development principles are more effective than others. Although this may well be the case, the evidence from rigorous evaluations is too thin to prove or disprove the hypothesis; several of the programs noted have not been rigorously evaluated. Moreover, it may be difficult to achieve consensus about which particular programs reflect youth development principles and which do not. The individual and social costs of ignoring high school dropouts “or of focusing attention and resources only on those who show up in the criminal justice and welfare systems “are potentially enormous. Thus, the argument for investing more public funds in services, systems, and research for these young people is strong, even during a period when public resources will be severely constrained. It is clearly necessary to improve and expand prevention-oriented programs in the schools, beginning as early as preschool, but the need for strong second-chance programs for out-of-school youth is also obvious. As noted, in some cases, second-chance programs can operate within the K–12 education system, drawing on its relatively stable funding. The challenge, again, is that the knowledge base on the effectiveness of second-chance programs is still thin. Relatively few programs have been rigorously tested, and even fewer have produced unambiguously positive results. The paucity of conclusive evidence makes it hard to know how to direct resources and magnifies the importance of ensuring that all new initiatives provide for rigorous evaluation of their impacts. Although states and localities will deliver or manage most of the services for these youth, the federal government plays a key role in funding, promoting innovation, and identifying and disseminating evidence about what works. Whatever the specific format, a new round of youth-focused research might be structured around three general topics. The first would be how to improve outcomes for dropouts who enroll in youth programs or otherwise seek to continue their education or find jobs. The second would be how to identify and disseminate strategies to engage young people who are more seriously disconnected and unlikely to join programs. The final topic, not a focus of this paper, would be descriptive and process studies of local-level “systems” to support disconnected youth. A recurring theme in the discussion below is that providing young people with opportunities for paid work may be useful both as an engagement tool and as a strategy for improving long-term labor market outcomes. As noted, most dropouts eventually seek to continue their education or find jobs. Assessing, improving, and, where appropriate, expanding the programs that serve these young people is critical. In this section I describe three possible areas for investigation. 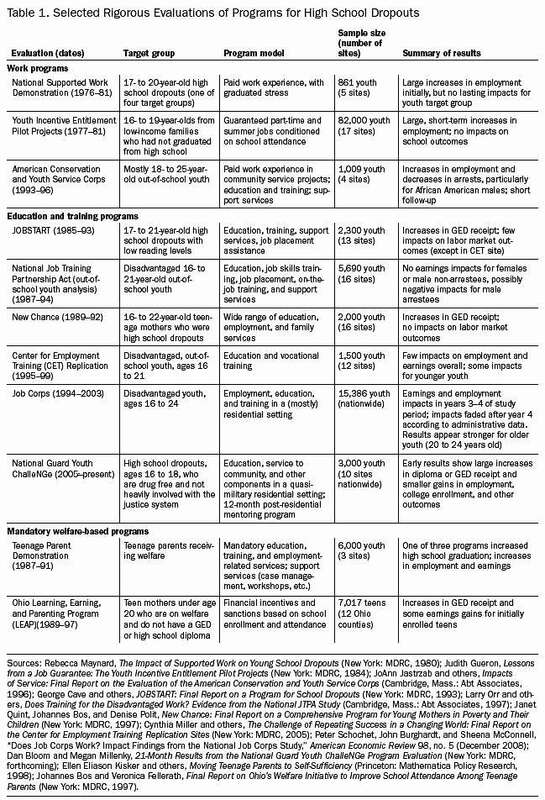 Existing youth programs. Many dropouts find their way to large programs or networks such as the Job Corps, YouthBuild, ChalleNGe, and the Service and Conservation Corps. These programs or networks often have relatively well-developed systems to ensure quality and disseminate program improvement strategies. A rigorous evaluation of the Job Corps has recently been completed, similar evaluations of ChalleNGe and the Service and Conservation Corps are under way, and an evaluation of YouthBuild is being planned as of this writing. If evaluation results are positive or even mixed, these programs should be expanded to serve more young people, while any shortcomings are being addressed simultaneously. Periodic smaller-scale, targeted evaluations could assess the progress of program improvement efforts or test the incremental impact of program enhancements, such as stronger transition services or tighter links with employers. Other dropouts enter a wide variety of community-based programs funded by the Workforce Investment Act (WIA) and a wide array of other sources. Although the Department of Labor is planning a national evaluation of the WIA system, it is neither feasible nor appropriate to try to evaluate every program using a rigorous design, and it will always be difficult to ensure the quality and effectiveness of thousands of independent youth programs across the country. Measuring program outcomes is necessary, but does not ensure quality because programs that achieve good outcomes do not necessarily generate strong impacts (for example, they may serve youth who are relatively likely to succeed on their own). Initiatives like the National Youth Employment Coalition's Promising and Effective Practices Network (PEPNet) are designed to assess and enhance the quality of youth programs. Individual programs that appear particularly promising or innovative could receive financial incentives to participate in rigorous, federally funded evaluations. Those with positive results would be expanded or replicated. It would be useful if some tests of existing youth programs could be structured as “differential impact studies” that assess the impact of particular program components. For example, it would be useful to understand the incremental impact of paid subsidized employment “a relatively expensive component–for particular categories of young people. Strategies for youth with weak academic skills. Ongoing efforts to help dropouts access postsecondary education are exciting, but it is important to recognize that not all young people have the interest or the academic ability to attend college. Young people with weak reading and math skills must also have effective options. As noted, some young people who are not interested in or qualified for academically focused postsecondary programs may benefit from occupationally oriented options. Jobs for the Future is seeking to develop intensive twelve- to twenty-four-month “Career First” programs that expand the limited options available for young people who want to find good jobs but are not prepared for college. In addition, some experts have argued that various forms of apprenticeships and internships are the most promising strategy to improve labor market outcomes for many disadvantaged youth.35 When they are operating at a steady state, these models should be evaluated and, where appropriate, replicated. For dropouts with very low levels of basic reading and math skills, postsecondary education, or even a GED, may not be a realistic short-term goal. Such youth may be neglected by programs whose focus is on helping participants pass the GED or find jobs relatively quickly. For example, some ChalleNGe and YouthBuild programs accept only young people who can read at a certain grade level. Ironically, the push to build links between youth programs and postsecondary education may unintentionally exacerbate this problem by encouraging programs to target dropouts who have the best chance to enter college. Experts report that programs targeting dropouts with very low reading and math skill levels are quite rare. The Youth Development Institute’s Community Education Pathways to Success program is one model that seeks to help community-based organizations better serve youth who are not ready for GED programs, but much more research and experimentation is needed in this area. Research should focus not only on how best to teach young people with very low skills, but also on how best to retain them in programs long enough to make a difference. Paid work opportunities and performance-based financial incentives are two strategies that may be worth testing. Almost all of the evaluations discussed above focused on youth who voluntarily came forward to join programs. But the reality is that many young people, both high school dropouts and struggling high school graduates, do not seek out programs. Advocates note, correctly, that the existing infrastructure of youth programs serves only a small fraction of the young people who need help. But it is also true that many youth programs struggle to recruit enough young people to fill their slots. Thus, a second goal of research should be to identify and disseminate effective strategies to engage profoundly disconnected young people who are unlikely to volunteer for programs like YouthBuild, the Job Corps, or ChalleNGe. At a broader scale, engagement-focused demonstration projects might operate at the neighborhood level, seeking to saturate communities with work opportunities or other supports for youth. The Youth Entitlement project, described earlier, used this approach but mostly served in-school youth. A variation might be designed to engage more out-of-school youth. Projects of this type would also help to address the collapse of the youth labor market already noted. The much-discussed Harlem Children's Zone is another community-level model for engaging youth.38 Although complex, geographically targeted initiatives are challenging to implement and evaluate, there may be synergistic effects from combining a range of proven program models in a single location. Young people who drop out of high school are a diverse group. Some will continue their education and get back on track, but many others, including a large share of dropouts from low-income families, will find it extremely hard to make a successful transition to adulthood in a labor market that offers fewer and fewer opportunities for workers with no postsecondary training or education. The nation's schools, from preschool to high school, place a strong and appropriate emphasis on prevention-oriented programs and policies to keep students on track, but many thousands of youth nevertheless drop out every year, and the human and fiscal costs of neglecting them would be enormous. Many young people who leave school attempt to reengage as they mature, and both rigorous research and practitioner wisdom suggest that many second-chance programs are worthy of investment and expansion. At the same time, much remains to be learned. It is important to keep assessing and strengthening existing programs, for example, by building stronger links to employers. It is also necessary to develop multiple pathways for youth who drop out. Some young dropouts have the interest and aptitude to move into academic postsecondary programs; others would do better in occupationally oriented programs; and still others need special approaches tailored to youth with very low levels of basic skills. Many young people at all skill levels might benefit from opportunities for paid work experience. Finally, it is critical to identify and disseminate lessons on how best to reengage the most disconnected young people, many of whom will need to be reached through public systems like juvenile and criminal justice or child support enforcement. The National Center for Education Statistics estimates the number of dropouts at about 3.5 million. Analysis by the Center for Labor Market Studies at Northeastern University, which considers GED holders as dropouts, counts dropouts who are institutionalized, and uses a different estimation methodology, places the number of dropouts at about 6 million. National Center for Education Statistics, The Condition of Education (Washington: National Center for Education Statistics, 2009), table A-20-1; Center for Labor Market Studies, Left Behind in America: The Nation's Dropout Crisis (Boston: Northeastern University Center for Labor Market Studies, 2009). In this article, I focus mainly on high school dropouts. However, studies have found a large share of high school graduates not to be adequately prepared for work or college. Overall, about 45 percent of twenty-one-year-olds have a high school diploma or GED and are not enrolled in college; about 20 percent of that group is not employed. Many of the programs and policies discussed in this paper are potentially relevant to high school graduates as well as high school dropouts. Data on dropouts by income are from 2006. See National Center for Education Statistics, Digest of Education Statistics: 2007 (Washington: National Center for Education Statistics, 2008), tables 105 and 106. Data on dropouts by race and ethnicity are from 2007. See National Center for Education Statistics, The Condition of Education (Washington: National Center for Education Statistics, 2009), table A-20-1. Robert Balfanz and Nettie Legters, Locating the Dropout Crisis (Baltimore: Center for Research on the Education of Students Placed at Risk, 2004). For example, James Heckman and Paul LaFontaine write that “the true high school graduation rate–has been declining over the past 40 years [and]–majority/minority graduation rate differentials are substantial and have not converged over the past 35 years.” Lawrence Mishel and Joydeep Roy conclude that “high school completion has grown significantly over the last 40 years and the black-white gap has shrunk significantly.” James Heckman and Paul LaFontaine, “The American High School Graduation Rate: Trends and Levels,” NBER Working Paper 13670 (Washington: National Bureau of Economic Research, 2007). Lawrence Mishel and Joydeep Roy, Rethinking High School Graduation Rates and Trends (Washington: Economic Policy Institute, 2006). Andrew Sum, “The Deterioration of the Teen and Young Adult Labor Market in the U.S. and Their Adverse Consequences for Marriage, Out of Wedlock Childbearing, Young Family Economic Well-Being and Children in These Families,” Powerpoint presentation (Boston: Northeastern University Center for Labor Market Studies, 2009). Steven Raphael and Michael Stoll, “Why Are So Many Americans in Prison?” in Do Prisons Make Us Safer? edited by Steven Raphael and Michael Stoll (New York: Russell Sage Foundation, 2009). Caroline Wolf Harlow, Education and Correctional Populations (Washington: Bureau of Justice Statistics, 2003). Andrew Sum, “The Deterioration of the Teen and Young Adult Labor Market” (see note 5). John Bridgeland, John DiIulio, and Karen Burke Morison, The Silent Epidemic: Perspectives of High School Dropouts (Washington: Civic Enterprises, 2006). David Hurst, Dana Kelly, and Daniel Princiotta, Educational Attainment of High School Dropouts 8 Years Later (Washington: National Center for Education Statistics, 2004). Cheryl Almeida, Cassius Johnson, and Adria Steinberg, Making Good on a Promise: What Policymakers Can Do to Support the Educational Persistence of Dropouts (Boston: Jobs for the Future, 2006). Laura Wycoff and others, Disconnected Young People in New York City: Crisis and Opportunity (Philadelphia: Public/Private Ventures, 2008). National League of Cities, Beyond City Limits: Cross-System Collaboration to Reengage Disconnected Youth (Washington: National League of Cities, 2007). Table 1 lists the sources for the evaluation results discussed in the text. For a more detailed synthesis that includes many of the same studies, see Susan Jekielek, Stephanie Cochran, and Elizabeth Hair, Employment Programs and Youth Development: A Synthesis (Washington: Child Trends, 2002). The Youth Incentive Entitlement Pilot Projects used a “saturation” approach in which all youth in particular neighborhoods or small cities were guaranteed jobs under certain conditions. Thus, it was not feasible to randomly assign individuals to program or control groups. Instead, the study compared YIEPP sites to other neighborhoods or cities. YIEPP served both in-school and out-of-school youth. For more information on these programs, see Stuart Kerachsky and others, The Impacts of Transitional Employment for Mentally Retarded Young Adults (New York: MDRC, 1985); MST Services, Multisystemic Therapy at a Glance (Mt. Pleasant, S.C.: MST Services, 2005); Julia Littell, “Lessons from a Systematic Review of Effects of Multisystemic Therapy,” in Children and Youth Services Review 27 (2005). The Job Corps evaluation collected data on employment and earnings from both surveys and administrative records during the first four years of the study period, and from administrative records only in years five through ten. The positive effects on earnings and employment in years three and four were measured with both data sources, though they were much larger in the survey than in the records. James Kemple, Career Academies: Long-Term Impacts on Labor Market Outcomes, Educational Attainment, and Transitions to Adulthood (New York: MDRC, 2008). John Tyler, “The General Educational Development Credential: History, Current Research, and Directions for Policy and Practice,” in Review of Adult Learning and Literacy, volume 5 (Boston: National Center for the Study of Adult Learning and Literacy, 2005). Robert Ivry and Fred Doolittle, Improving the Economic and Life Outcomes of At-Risk Youth (New York: MDRC, 2003). Rhonda Tsoi-A-Fatt, A Collective Responsibility, A Collective Work: Supporting the Path to Positive Life Outcomes for Youth in Economically Distressed Communities (Washington: Center for Law and Social Policy, 2008). Kenneth Dodge, Thomas Dishion, and Jennifer Lansford, editors, Deviant Peer Influences in Programs for Youth: Problems and Solutions (New York: Guilford Press, 2007). Hugh Price, “About Face: A Case for Quasi-Military Public High Schools,” in Educational Leadership 65, no. 8 (May 2008); Daniel Donohue, Designing a ChalleNGe-like Program for High School Dropouts and Students Who Are Drifting Through School, Disengaged and Repeating Grades (Fairfax Station, Va.: Donohue Associates, 2008). Public/Private Ventures, “Serving High-Risk Youth: Lessons from Research and Programming” (Philadelphia: Public/Private Ventures, 2002). Michael Karcher, “The Study of Mentoring in the Learning Environment: A Randomized Study of the Effectiveness of School-Based Mentoring,” Prevention Science 9, no. 2 (June 2008); Joseph Tierney and Jean Grossman, Making a Difference: An Impact Study of Big Brothers/Big Sisters (Philadelphia: Public/Private Ventures, 2000). Peter Edelman, Mark Greenberg, and Harry Holzer, “Youth Policy Proposals” (Washington: Georgetown Center on Poverty, Inequality, and Public Policy, 2008). Charles Betsey, Robinson Hollister, and Mary Papageorgiou, editors, Youth Employment and Training Programs: The YEDPA Years (Washington: National Academy Press, 1985). American Council on Education, 2007 GED Testing Program Statistical Report (Washington: American Council on Education, 2008). Cynthia Zafft, Silja Kallenbach, and Jessica Spohn, Transitioning Adults to College: Adult Basic Education Program Models (Boston: National Center for the Study of Adult Learning and Literacy, 2006). Louis Jacobson and Christine Mokher, Pathways to Boosting the Earnings of Low Income Students by Increasing Their Educational Attainment (Washington: Hudson Institute Center for Employment Policy, 2009). Harry Holzer and Robert Lerman, The Future of Middle Skill Jobs (Washington: Brookings Institution, 2009). David Jenkins, Matthew Zeidenberg, and Gregory Kienzl, Educational Outcomes of I-BEST: Findings from a Multivariate Analysis (New York: Community College Research Center, 2009). Robert Lerman, “Are Skills the Problem? Reforming the Education and Training System in the United States” in A Future of Good Jobs? (Kalamazoo, Mich.: W.E. Upjohn Institute for Employment Research, 2008). See, for example: Gordon Berlin, Rewarding the Work of Individuals (New York: MDRC, 2007); Harry Holzer, Peter Edelman, and Paul Offner, Reconnecting Disadvantaged Young Men (Washington: Urban Institute Press, 2006). Edward DeJesus, Countering the Urban Influence (Montgomery Village, Md. : Youth Development and Research Fund, 2005); Youth Development and Research Fund, Listening to the Voices and Aspirations of Disconnected Youth (Montgomery Village, Md. : Youth Development and Research Fund, 2007). The Harlem Children's Zone is an ambitious, comprehensive initiative targeting one hundred blocks in Central Harlem. It includes a wide range of programs for children, from preschool through college, along with efforts to strengthen families and “reweave” the neighborhood's social fabric. The initiative’s goal is to create a “tipping point” so that children are surrounded by supportive adults and peers. See www.hcz.org. See, for example, Wendy McClanahan, Alive at 25: Reducing Youth Violence through Monitoring and Support (Philadelphia: Public/Private Ventures, 2004). This feature: Bloom, D. (2010). Programs and policies to assist high school dropouts in the transition to adulthood. Transition to Adulthood, 20, 1. Spring. From The Future of Children, a Collaboration of The Woodrow Wilson School of Public and International Affairs at Princeton University and The Brookings Institution.